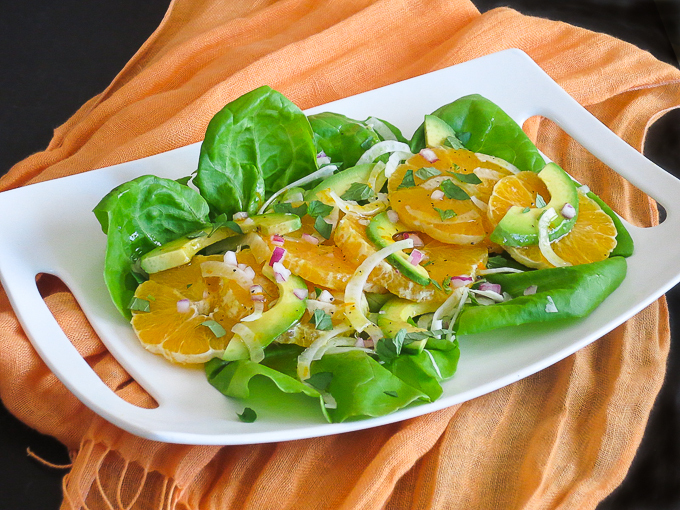 I’m so excited to share this Orange, Avocado & Fennel Salad with you today. It’s the bomb! I made it last night to accompany some bbq chicken and it was sooooo yummy. Like lick the plate clean yummy! So good in fact, I’m going to make it again for lunch today! I’ve seen orange and avocado salads around before so I wanted to add something a little different to the mix. First I thought about jicama. I couldn’t find any at the grocery store so I grabbed a fennel bulb instead. I love fennel and thought it would pair nicely with the citrusy orange and creamy avocado. I was afraid the anise flavor from the fennel might overpower the other flavors so I didn’t add as much as I will next time. But I’m a huge fennel fan so if you like it as much as I do, go ahead and add more to the salad. I thought this orange, avocado & fennel salad would look beautiful composed instead of tossed so I layer the ingredients on a bed of tender butter lettuce. You could use spinach or field greens if you have that on hand. I found a red onion in the refrigerator so I chopped up a bit of that as well. I’m not a big fan of raw red onions, so that’s why I diced them small. If you love red onion you certainly could slice it into rings for the salad which would look really pretty. Or, try some thinly sliced shallots. That’s what I’m going to try today when I make this again! I also had some mint, so what the heck, I chopped up some to sprinkle on top. Delicious! The dressing for this salad is pretty much a simple standard vinaigrette. I used a ratio of 3:1 oil to vinegar. I used a good quality olive oil for the oil. For the vinegar I used champagne vinegar. You could also use a white wine vinegar if you don’t have champagne vinegar. I thought the dressing needed a bit of sweetness so I added some agave nectar (honey would be delicious too). A pinch of salt and pepper and some orange zest were added. I only made a small portion of the dressing to dress this salad, but I recommend doubling the recipe to have on hand in the refrigerator (because, if you’re like me, you WILL be making this again). We loved this Orange, Avocado & Fennel Salad so much we found ourselves swiping our fingers on the empty plate for one last taste. It’s that good! Combine dressing ingredients in small bowl and whisk well. Set aside in refrigerator until ready to serve. Lay butter lettuce leaves on platter. Layer oranges, avocados, and fennel slices. Sprinkle mint and red onion on top. Drizzle dressing over salad. Thanks Judy, Your ‘Momma’ loved, loved, loved this delicious salad! It’s now a favorite of mine. So pretty too. Can’t wait for you to make it again for lunch today. Now I know what to make for lunch! Thank you!! We love fennel and orange salads. They are so easy to make. Your addition of avocado is brilliant. 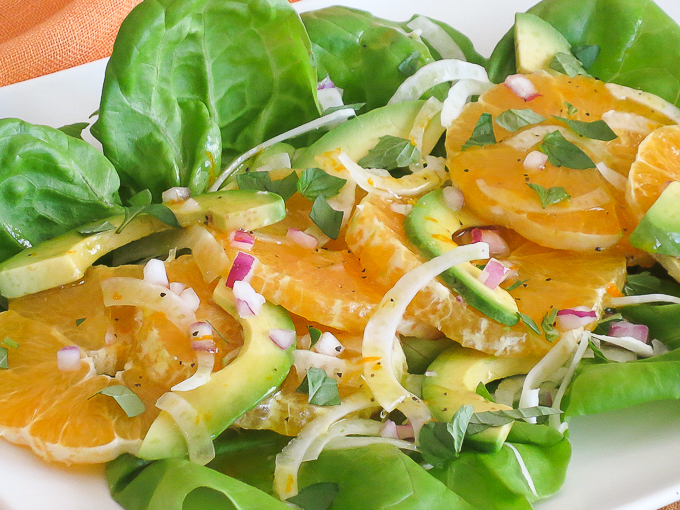 I love fennel, oranges and avocado, so this is my kind of salad, it sounds delicious! This looks amazing! I’ve recently fallen in love with fennel and this is a perfect way to use it! What a gorgeous salad! Such an interesting combo, I never would have thought of it before. Yum!